I took an all day class on how to do maintenance on my Gammill Classic quilting machine and it was amazing! If you don’t have a long arm quilting machine think of it like this… I learned how to tune up my car myself instead of shipping it to the next state to have someone else tune it up my car and change the oil for me. Kevin and I loaded up the machine then I drove 4 hours over to Zanesville, OH, to A Touch of Thread quilt shop for the class. I learned how to do all the maintenance myself, such as, cleaning and rebuilding the disk and rotary tensions (three top tensions and one bobbin tension), the bobbin winder, needle bar, presser foot, hook assembly, adjusting the belt, and so much more. But the best part of the class was removing the fear of trying to adjust something myself. Now, I won’t hesitate to pick up a screwdriver and take it apart. You just can’t buy confidence. So, to check out the machine and make sure it works like it’s supposed to (once I got back to Indy and got the it back into the frame), I pulled this quilt top off the shelf and quilted it. It’s a fairly small quilt, only about 40” square, but it was a good test. (I’m still working on sewing the binding to the back of the quilt.) Works great for an 18 year old machine! I have several quilt tops in Wandaland that need to be quilted. So, in future weeks, you may see more ‘Finish That Quilt’ projects. 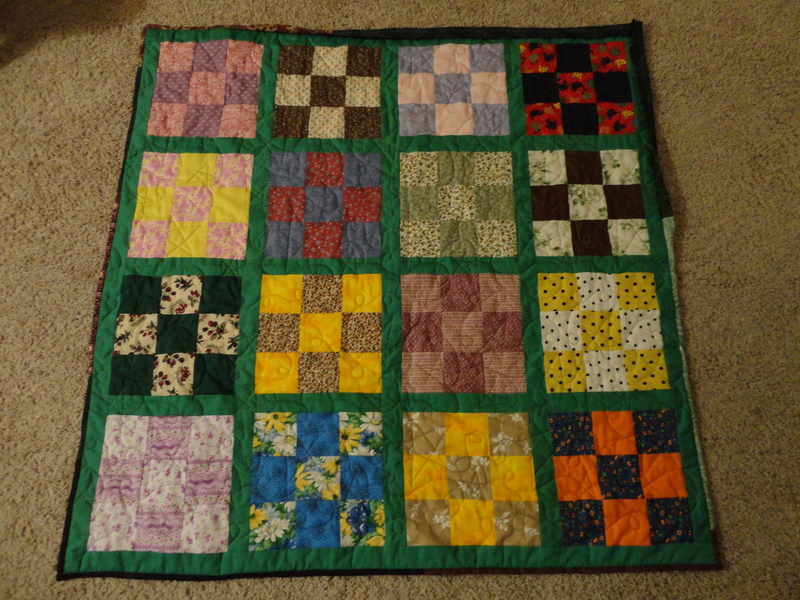 Note – Between the time I took the picture and actually made this post, I’ve finished the quilt binding. I’ll run it through the washer and dryer then it’ll be nice and soft and ready to use. 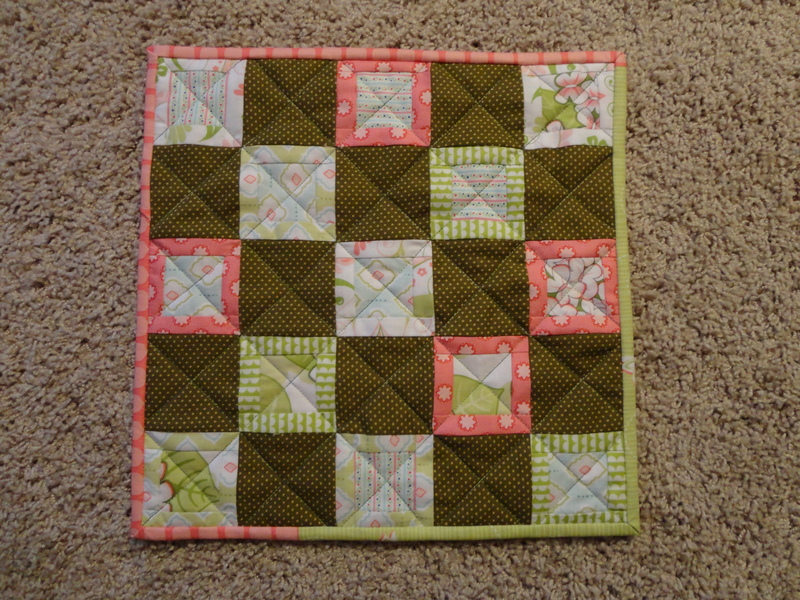 This is a pattern from Easy Quilts, Summer 2012, that was really fun to make. And yes, it was easy. First of all it’s only 12” x 12” and uses just a little bit of fabric. What a great way to use up some leftover fabric from a larger project. Actually, I got these fabrics as a collection of 2 ½” strips from Keepsake Quilting (Fabric of the Month Club – how fun is that?). Normally, I wouldn’t have chosen them, but they came as a set. And you know what, I kinda like them. What a great way to try out new fabrics. Expand your color and pattern choices – and have fun at the same time. OK, so this is really a continuation from Week 2. Did you ever have an idea and just couldn’t let it go? That’s what happened here. 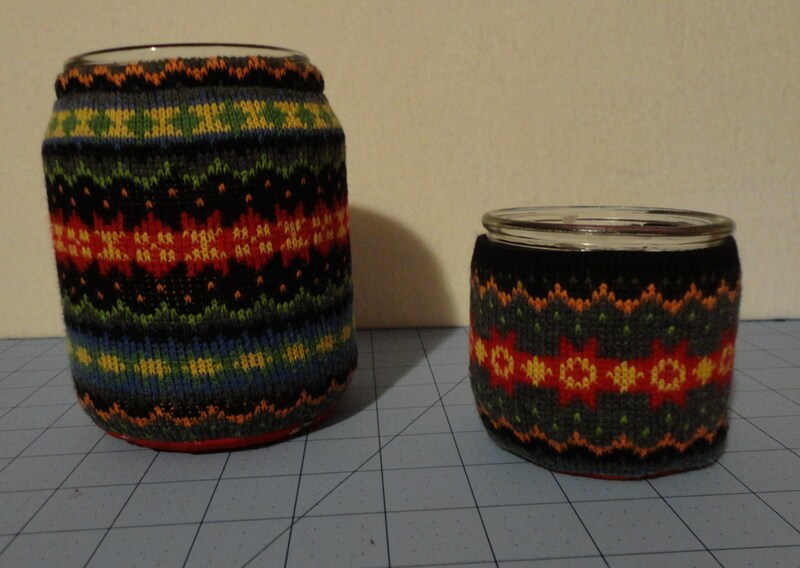 After I made the candle jar cozies last week, I just couldn’t stop thinking about them. From out of the blue I got the idea to use a sweater sleeve to make the cozy. 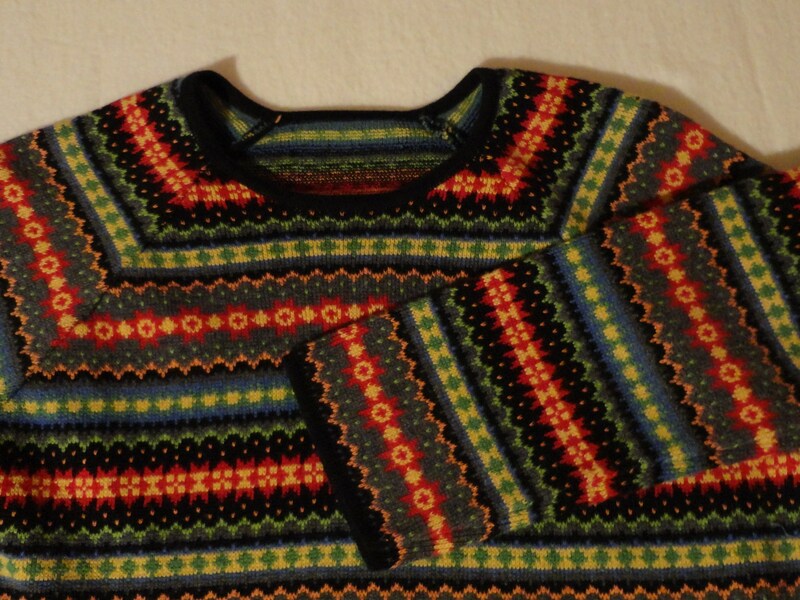 So off I went to Goodwill to buy a sweater. I cut off the sleeve near the cuff and made the cozy for the smaller candle using the cuff edge as the top edge of the cozy. This way the top edge is already done for you. It still has the fabric bottom to protect the glass. I then cut up a little further on the sleeve where it’s bigger for the larger jar. However, I now had to finish the top edge with a bit of elastic. Also it was not a true cylinder shape because of the shape of the sleeve, so I had to sew another seam close the one already there to make it the same dimension around the top and the bottom, sew on the bottom and magic – a Sweater Candle Jar Cozy! I also had thoughts of making them from lace or pretty ladies hankies, but that may have to wait for another day.